What role does collaboration play in the circle of influence? “If you don’t have time to read, you don’t have the time (or the tools) to write.” This often-quoted line from Stephen King’s On Writing: A Memoir of the Craft is a simple statement, but nonetheless profound in its acknowledgement of the literary tradition. Reading widely and well arms the author with knowledge of context and craft that can elevate a piece from good to great. 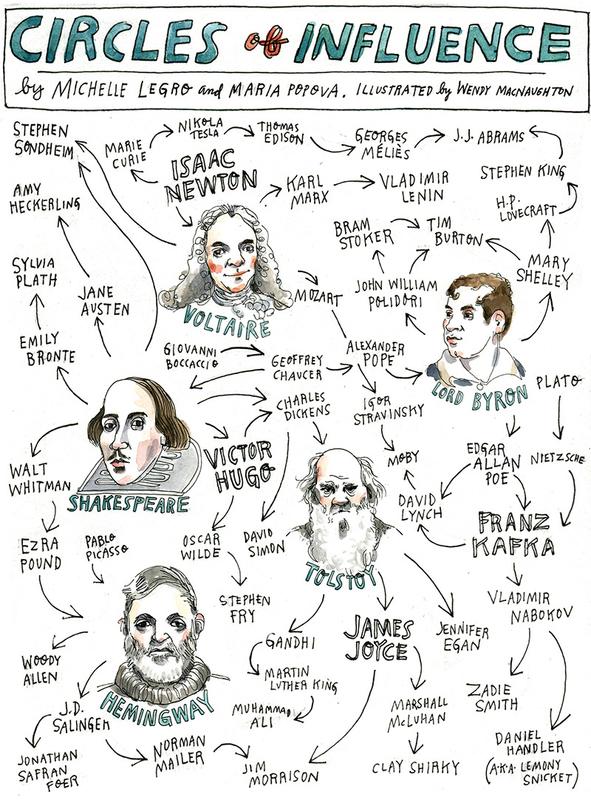 Brain Pickings published an informative chart illustrating the “Circles of Influence” that produced some of today’s most popular artists. Sometimes it’s easy to trace a writer back to formative influences: H.P. Lovecraft begets Stephen King, for example. 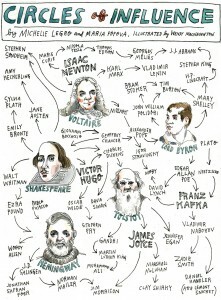 Other times, an author’s literary lineage comes as a surprise. Lord Byron certainly wouldn’t make it on my list of Lemony Snicket’s main influences. Distinguishing influence becomes even trickier when artists collaborate, and it can become impossible to discern who impacted who. The source of this problem resides in the mechanism behind the circles of influence. Literary influence isn’t always the conscious process King describes. It isn’t always a writer equipping tools. Brain Pickings describes the process of intellectual exchange more as “the cross-pollination of disciplines across science, art, literature, film and music.” Sometimes, it’s more of an unconscious influence, one as pervasive and natural as pollination. What you read influences what (and how) you write. You are what you read. It’s a variation on an old cliché, but like most clichés, its merit lies in a truism. We now know that reading can change how your brain works, so the logical progression follows that reading can also change your writing. I remember my visceral horror when one of my writing mentors described the phenomena in the wake of Twilight in the YA lit boom. Increasingly, her students wrote about characters “chuckling darkly” with “piercing eyes.” Stephenie Meyer had trickled into the shared consciousness of adolescents everywhere. Being an omnivorous reader, the subject matter didn’t scare me as much as the concept. I hated the idea that I didn’t control my own writing, as I have never been one to subscribe to the concept of the literary muse. Of course, I welcomed influences, but I wanted to be consciously aware of them. I wanted to choose and cultivate, not plant a mystery seed and watch, breath bated, as it grew. For a brief period, I embarked on a literary detox. No more beach reads. No more books written for younger audiences. I waited until I was sufficiently satisfied that nothing remained but my own voice. Then I stocked up on some of the literary greats. Soon I noticed the way authors leaked into my own writing. I read some Faulkner novel that I could not really understand (but pretended to understand because I was too proud to admit otherwise) and I decided to write. Upon placing my fingertips to keyboard and typing I started spinning out lengthy and labyrinthine sentences the meanings of which I also probably could not understand but there on the screen they glowed profoundly. I also took it upon myself to read Jane Eyre, after which, my diction shifted to a positively comical mix of modern and Victorian. My thoughts veered into profoundly existential territory for a freshman in high school. I felt like a mime and a fraud. Not once did I consider that maybe I took myself too seriously, and that maybe this was a universal problem I experienced. Fortunately, my stint of detox only lasted until the publication of the next YA box office hit. I realize now that it was all a part of the process of finding my voice. So what about you? Have you ever noticed the circle of influence impacting your voice? Is this something to be celebrated, or are more literary detoxes in order?